Melati Suryodarmo born 1969 in Surakarta Indonesia, lives and works since 1994 in Germany. She studied International Relations and Political Sciences in Bandung, Indonesia and at the Hochschule fuer Bildende Kuenste Braunschweig with Anzu Furukawa and Marina Abramovic (performance art and Raum Konzept). In 2002 she has completed her Meisterschule (MFA) in Performance Art Studies. 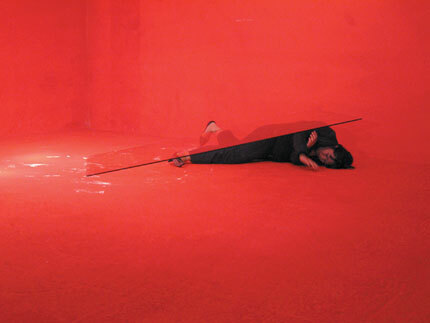 Melati Suryodarmo has been participating in various international performance festivals and exhibitions since 1996, including at the IPFO Denmark 2003, the 50th Venice Biennale, Marking the territory, IMMA Dublin, the Van Gogh Museum Amsterdam 2005, Videobrasil Sao Paolo 2005, Haus der Kulturen der Welt Berlin 2005, the 52nd Venice Biennale, KIASMA Finland 2007 and recently at the Lilith Performance Studio Malmo, Sweden. 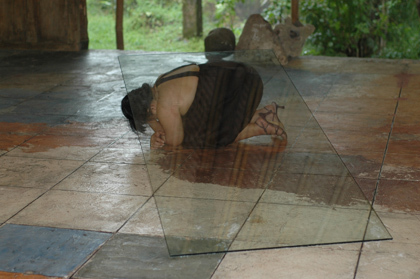 She has organized several group exhibitions and performance events in Europe and since 2007, the „undisclosed territory“, an annual performance art event in Solo Indonesia.